If you’re interested in purchasing new tech gadgets for yourself and your home, simply continue reading to discover some of the biggest tech gadgets of 2018. All of which are well worth splashing out on! The Fitbit Alta is the most high-tech Fitbit to date and is capable of tracking your workouts, how many steps you take each day, how many calories you burn, how many hours sleep you get per night and how many flights of stairs you climb. The Fitbit Alta also features a built-in heart rate monitor, which is helpful if you want to maintain a heart rate, during a workout which will increase the number of calories which you’ll burn. As a bonus, you can also receive text messages on your Fitbit Alta. If you enjoy adventurous activities such as mountain biking, kayaking, and snowboarding, you may want to invest in a brand new GoPro Hero5 Black. As it capable of being immersed in water to depths of 33 feet, without needing a waterproof case and can take 4k videos and 12MP photos. Even if you choose to shoot high definition 4k videos, you’ll be able to shoot 60-90 minutes of videos, before your GoPro runs out of battery. The Philips SmartSleep is an innovative wearable headband, which you wear to bed, which emits a tone which is scientifically proven to improve your body’s ability to enter slow wave sleep. A stage of sleep in which your brain waves start to slow down, which allow your body to recuperate faster and enter a deeper stage of sleep. If you’re not impressed yet, you may be impressed by the fact that the Philips SmartSleep boasts two unique sensors, one which notes when your body enters deep sleep. Proof is a discreet high-tech bracelet which can measure your blood alcohol levels and will alert you if you’ve drunk too much alcohol to safely drive home, on a night out. Nutale is set to become one of the world’s smallest GPS trackers and will make tracking valuable items such as your smartphone, wallet, and keys a breeze. Better yet each Nutale device is compatible with both Apple and Android devices and boasts an impressive 30-day battery life. Which is perfect, if you can’t be bothered to charge your GPS tracker on a weekly basis. If you love the functionality of Google Home and Amazon’s Alexa but would prefer your home assistant to look like a traditional robot, you may be interested in purchasing Kuri, the world’s latest loveable robot. Not only can Kuri complete all of the tasks which Alexa can handle such as being able to schedule appointments and play music but Kuri can also zoom around your home as your friendly robotic companion. 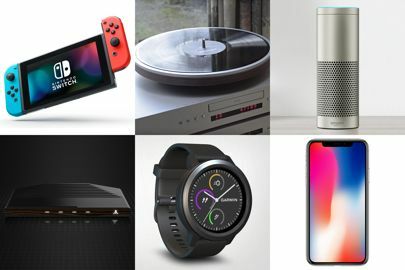 So if you love purchasing the latest and greatest tech gadgets, it’s well worth purchasing at least a couple of the innovative tech gadgets listed above!